Here we are 4 months after the closing. Our TV room is pretty well furnished, with a futon/couch that we found at a moving sale, an Ikea coffee table, stools we found in Fred Meyers, Ikea book shelf, and Ikea and media console. (Yeah – we’re still heavily reliant on cheap Scandinavian furniture. I joke to my husband, that it’s his heritage.) We found a dining table that seats 6 people for under $100 at the same moving sale. (Although they were also selling a fish stand and aquarium for $200+, but unfortunately that wasn’t something we were ready to jump the gun on. Not going to lie, most of what we’re looking at is either Ikea or Dania. For us, we’re looking for a simple slatted bed. 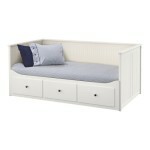 For the guest bed and other multi-purpose furniture, Ikea has a great selection of convertible day beds/single beds. I like this bed, since it’ doubles as a huge couch, single bed, or the equivalent of 2 single beds. We were looking at several different beds, but honestly, the look and price of this piece is right. It’s pretty comfy and we’re hoping that it helps when we have friends over. Some other beds we considered are Dania’s Oregon Sofa with Chaise. The living room is almost completely empty. Last week we got some Kallax bookshelves to start to fill that space, but we’re divided on what we want to do. My husband isn’t really keen to set up another sitting area, whereas, I think multiple nooks for sitting is fine. He wants to set up a craft desk in the living room, which I don’t know how that would work… but he’s the more adventurous one out of the two of us, so we’ll see. Eventually we’re hoping to move his baby Grand Piano into this space, but currently that’s in his parents’ place. Pretty self explanatory, right? We’re hoping to acquire a good 50″ and wall mount the screen. Am I missing anything? 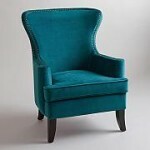 I’m planning a couple of other decorative things, but these are main pieces of furniture that we need to get. Also … rugs. My biggest beef with rugs are that a lot of them are just so ugly. They are so patterned or with a specific color, that it freaks me out to commit to it. I found some that I like, but compared to other necessities, this one may have to wait.